"No single molecular imaging modality provides a perfect diagnosis. Our nanoplatform is designed to enable multimodal molecular imaging, thus overcoming the intrinsic limitations of each single image modality while maximising their advantages," noted Marco Filice, a researcher in the Department of Chemistry and Pharmaceutical Sciences at the Complutense University of Madrid and the director of the study. The platform, which has been tested on mice, targets solid cancers such as sarcomas. "However, due to its flexibility, the proposed nanoplatform can be modified, and with a suitable design of recognition element siting, it will be possible to expand detection to more types of cancer," Filice said. Named after the Roman god Janus, usually depicted as having two faces, these nanoparticles also "have two opposing faces, one of iron oxide embedded in a silica matrix that serves as a contrast medium for MRI and another of gold for CT," explained Alfredo Sánchez, a researcher in the UCM Department of Analytical Chemistry and the first author of the study. Once the research team had synthesised the nanoparticles and determined their characteristics and toxicity, they then tested them in mouse models reared to present a fibrosarcoma in the right leg. 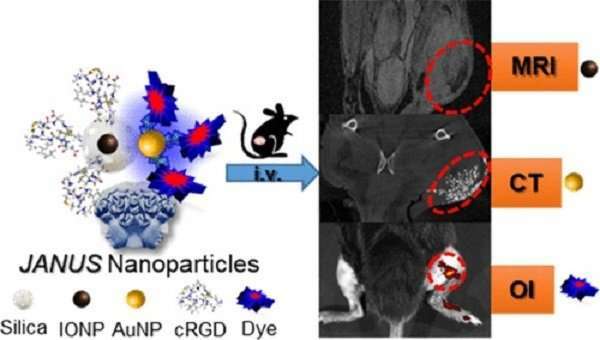 The nanoparticle was injected in the tail. "Excellent imaging results were obtained for each modality tested," reported Filice.